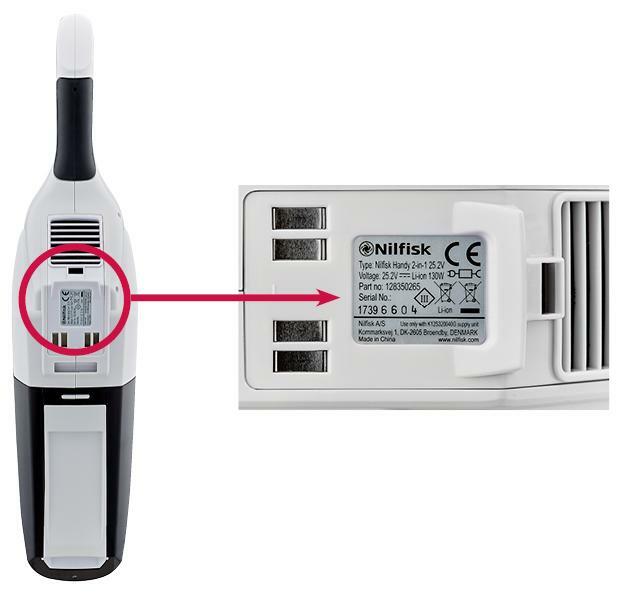 A causa di un possibile problema di sicurezza, Nilfisk richiama gli aspirapolvere selezionati Handy 2-in-1 25,2 volt e Handy 25,2 volt. Si richiede a tutti i consumatori che hanno acquistato un Handy 2-in-1 25,2 volt o Handy 25,2 volt dopo agosto 2017 di controllare il numero di serie sulla propria macchina. Il numero di serie è stampato sia sulla scatola che sul prodotto. Smettere di usare la macchina e scollegare il caricabatteria. Portare la macchina al negozio dove è stata acquistata. Vi verrà offerto un prodotto sostitutivo. Q: I own one of the affected vacuum cleaners. Is it dangerous? A: A limited number of the 25.2 volt Handy 2-in-1 and 25.2 volt Handy have a defect charging unit and a defect battery pack. If the product is left to charge continuously, this may lead to overheating of the product. Overheating can cause the product to catch fire which is potentially harmful. Q: I am unsure whether or not my vacuum cleaner is part of the recall, who can I contact? A: A: Please call your local Nilfisk customer support. You can find the telephone number on the Nilfisk website for your country. 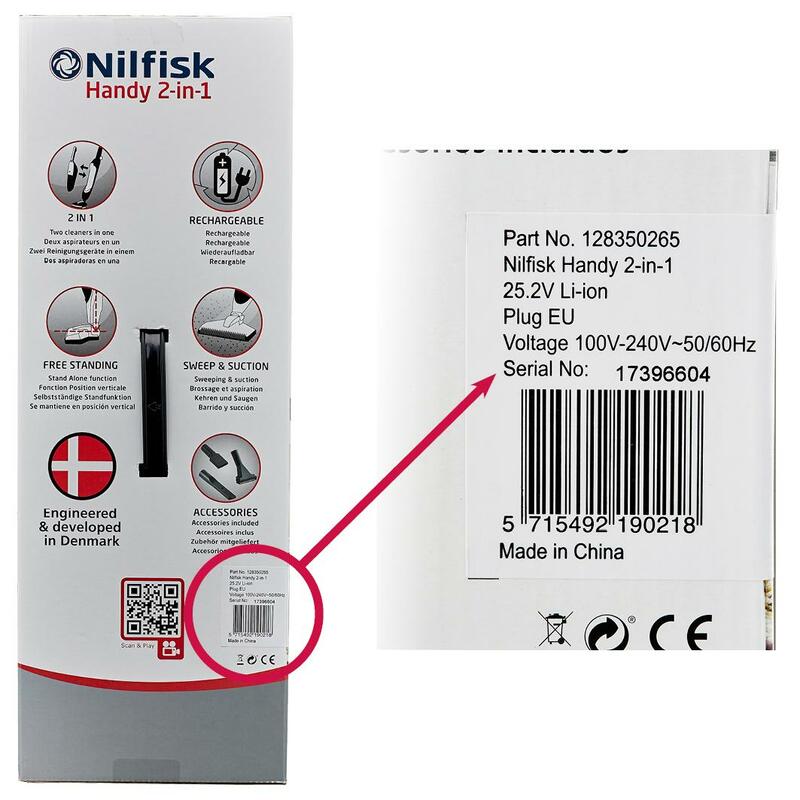 Q: Can I return my product in any store selling Nilfisk products? Or do I have to take it back to the specific store, where it was bought? A: You can return the product to any store within the chain it was bought. Q: I don’t know where my vacuum cleaner was purchased, where do I go to return it? A: Please call your local Nilfisk customer support. You can find the telephone number on the Nilfisk website for your country. Q: I bought my product online. Do I have to send it back to the online store, and who will cover my freight costs? Q: I no longer have the receipt for my vacuum cleaner, can I still return it? A: Yes, if you own a vacuum cleaner included in this recall you can return it to the chain of stores where it was bought – also without a receipt. 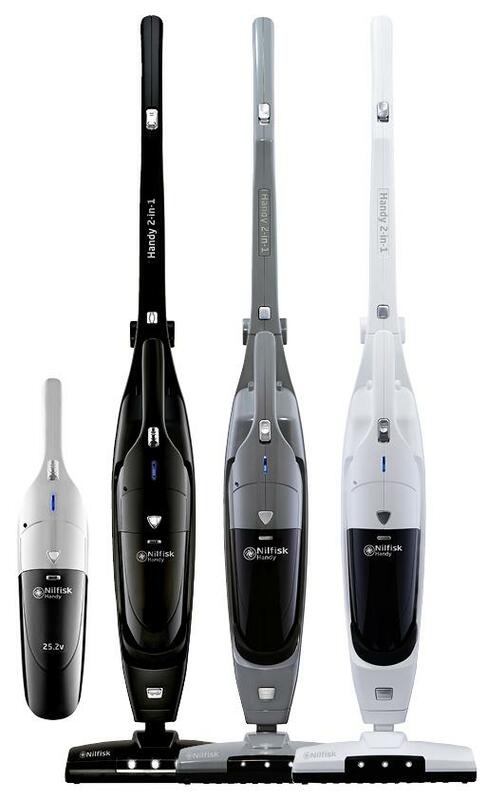 Q: I own a 14.4 volt or 18 volt Handy 2-in-1/Handy vacuum cleaner, are they part of the recall? A: No. There are no safety issues with either of these Handy 2-in-1/Handy models and they are not included in the recall. Q: I prefer to have my money back instead of a replacement product. Is this possible? A: No. When you return your product, you will get a new replacement 25.2 volt Handy 2-in-1 // Handy.